Both stylish and functional, our selection of coal hods are a great accent piece to your hearth. All styles feature a double bottom to insulate from hot ashes. 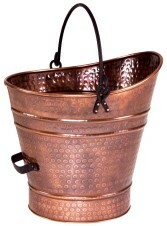 Choose from large or small and from all black or antique copper finish. Add a scoop to make the job even easier.